This Fall, New Conservatory Theatre Center reimagines Shakespeare's R&J, Joe Calarco's award-winning adaptation of Shakespeare's timeless play, in an all-new production set in a directed by NCTC's first Artistic Associate Ben Randle. Shakespeare's R&J begins previews November 7, opens November 14 through December 14. "Dare to rediscover Romeo & Juliet in this gripping 'vibrant, hot-blooded adaptation' (The New York Times)," NCTC Press describe the play. 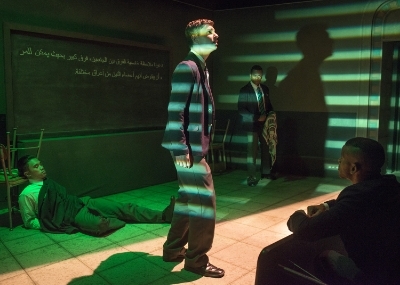 "The stakes are raised as four young men in modern-day Egypt secretly reenact the dangerous and provocative tale. 'Prepare for a bracing and brilliant shock to the system' (The Independent) as they explore love, passion and violence, amidst living in a land where revealing who you are can still be a crime." Shakespeare's R&J cast features Taj Campbell, James Arthur M., Adam Odsess-Rubin, and Mike Sagun. The full creative team of Shakespeare’s R&J includes scenic design by Yusuke Soi, lighting desihn by Christian Mejia, costume design by Jorge R. Hernandez, sound design by Steven Abts, and prop design by Adeline Smith. Playwright Joe Calarco’s work on Shakespeare’s R&J earned him a Lucille Lortel Award Off-Broadway, and he also directed the play's premieres in Chicago (5 Jeff Award nominations including Best Play and Best Director) and Washington, D.C. (Helen Hayes Award nominations for Best Play and Best Director). R&J completed a celebrated run on London's West End in late 2003. Other Off-Broadway credits include Floyd and Clea Under the Western Sky at Playwrights Horizons; Boy and In Transit (Drama Desk Nomination) at Primary Stages; in the absence of spring (writer/director) at Second Stage; Sarah, Plain and Tall at The Lucille Lortel. As a writer his published works include Shakespeare’s R&J, In The Absence of Spring, and Walter Cronkite is Dead. He is a Drama League Directing Fellow and Co-Artistic Director of Breaking Bread Theatre.